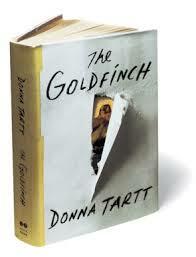 A fine thing about The Goldfinch is how Donna Tartt captures the way a place looks, smells and how it feels to be there. The story opens in post-9/11 New York and readers are soon inside the MMOA, home to “The Goldfinch,” Carel Fabritius’s priceless 1654 painting, which titles this long novel. Tartt repeats this sense of place when the action switches to a residential area of Las Vegas that is plagued with half built homes in empty subdivisions. This soulless expanse is populated by crooks, con artists, mobsters and desperadoes. It’s the perfect setting to build a friendship between Theo and Boris, two achingly likable thirteen year-olds who engage in a little of all the above behavior associated with bad guys. In my mind, one of Tartt’s greatest achievements here is the creation of Boris, a wily, abused, underfed Ukrainian urchin with the wits to survive and thrive in his own colorful way. He provides much of the action and rare moments of entertainment in this dark tale that at times bogs down. Theo, the protagonist, unlike Boris, is full of sorrow and unable to move beyond the tragic loss of his beloved mother. One of the best lines in the book was when Boris, with his broken English and bright spirit, lectures Theo about always being unhappy, because Theo is unable to make lemonade out of lemons (I paraphrase). The book has a little of everything: crime, suspense, international intrigue, imperfect love and damaged souls, especially Theo, who suffer, but mostly cope. Besides Theo, Boris and the Barbours, other memorable characters include Theo’s father and Xandra, the father’s girlfriend, as well as sweet, kind Hobie and mysterious Pippa. Finally, when an author like Tartt has the confidence, time and permission to write 800 pages, the novel should be flawless. This one might have been if it were at least a third shorter.